A review of the CD reissue of this record by Forgotten Records (fr-680) appeared on the MusicWeb International website on March 4, 2014. Written by Stephen Greenbank, this review includes: "Tchaikowsky achieves a beautiful translucent, bell-like tone. The finale is carefree, joyous and relaxed. 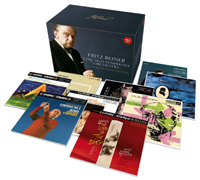 One can only marvel at the pianists pearl-like finger-work and evenness of tone." Read More. 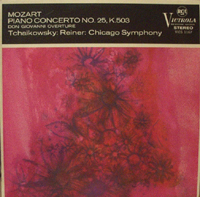 Originally, this LP record was to include two works featuring André Tchaikowsky: the Mozart piano concerto No. 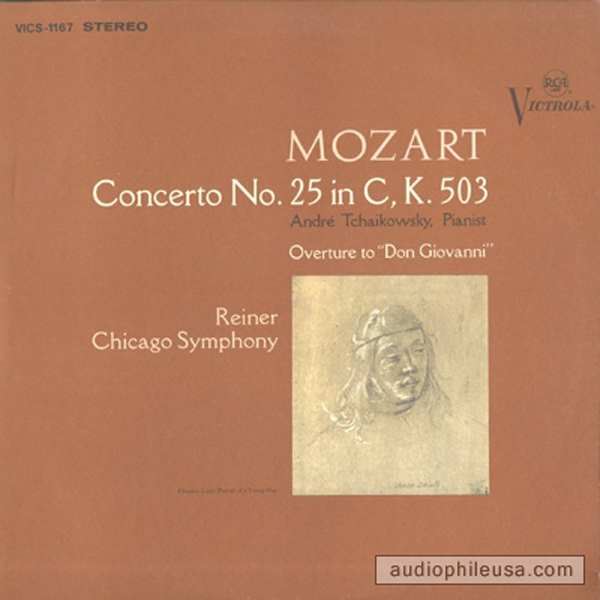 25, and the Bach piano concerto No. 5. Both works were recorded on February 15, 1958 and the record was to be released to the market in March, 1959. 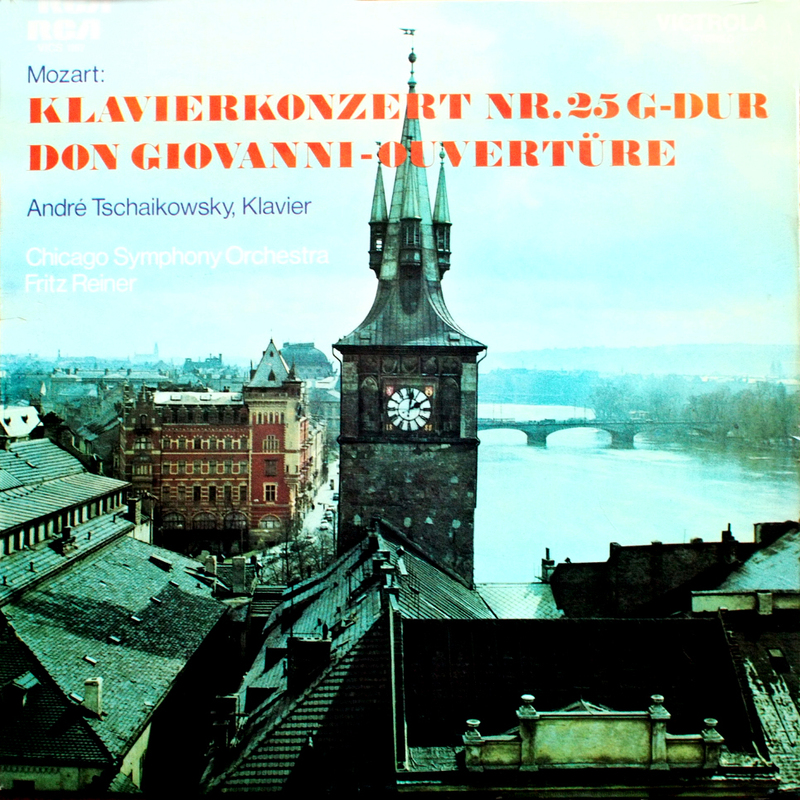 At the last minute, André Tchaikowsky rejected the Bach performance, requiring RCA to find an alternative work for the record, in this case, replacing the Bach concerto with the Mozart Overture to "Don Giovanni." 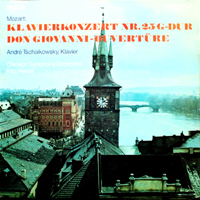 Since the Mozart Overture was recorded on March 15, 1959, the very month this record was to be issued, it is completely possible that replacing the Bach with the Mozart Overture was an emergency situation. 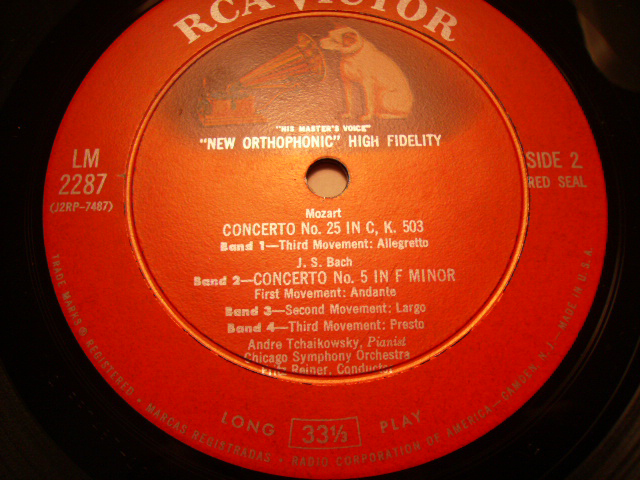 However, a number of the record labels had already been printed showing the Bach concerto on Side 2 and only in the nick of time were they able to rework the record jacket art to reflect the deletion of the Bach. 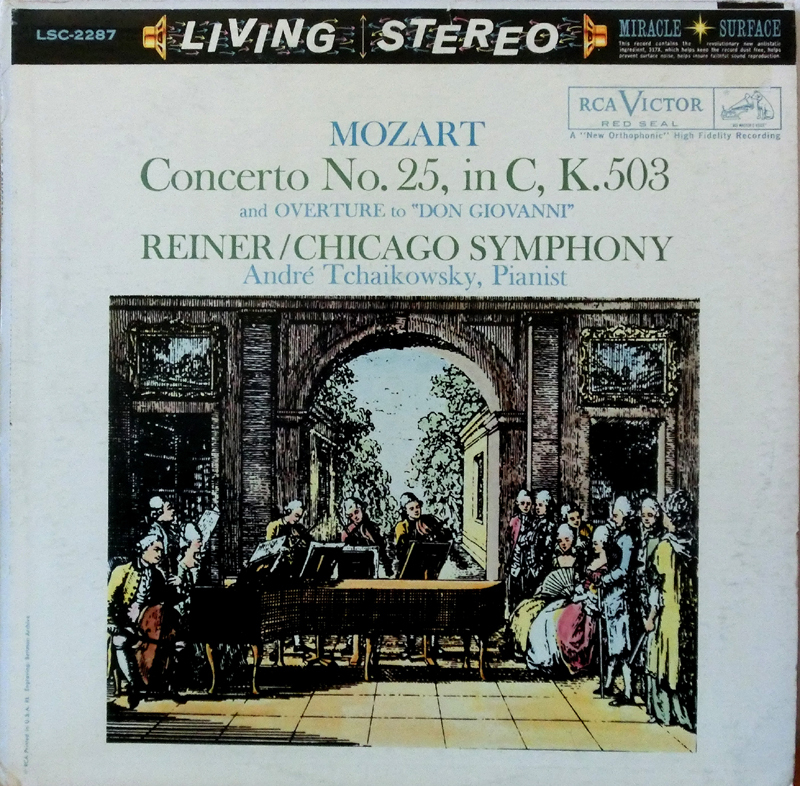 The result was that the initial offering of this recording still showed, on the record label Side 2, the Bach concerto (click the image on the left panel) when it was actually the Mozart Overture. 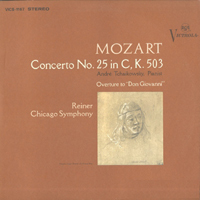 In subsequent production cycles, the "error" was fixed and Side 2 showed the Mozart Overture. 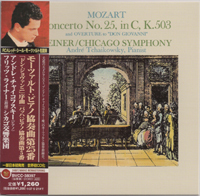 Oddly enough, an RCA Victor/BMG CD BVCC-38397 (Japan) was released in on November 22, 2006 that did include both the Mozart piano concerto No. 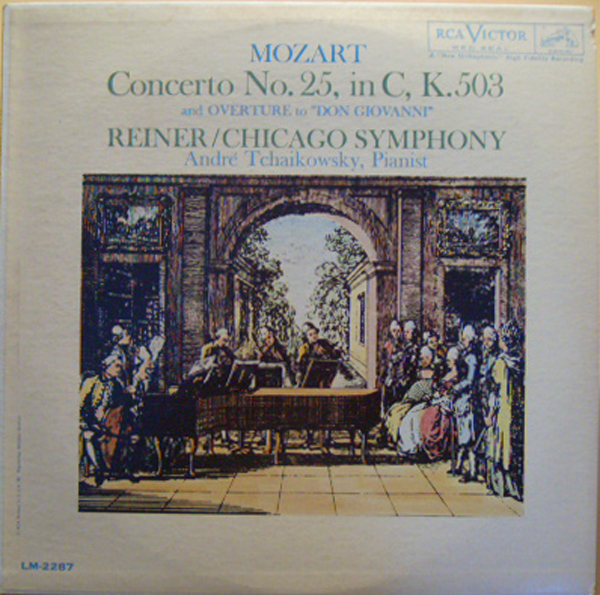 25 and the Bach piano concerto No. 5 as had been planned for so many years previously. 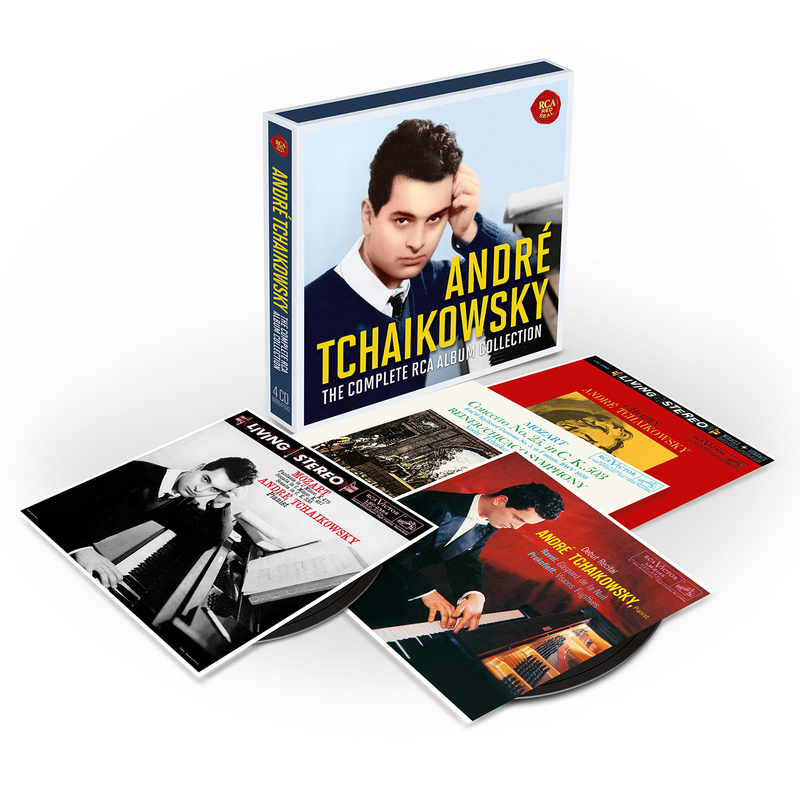 Of all the André Tchaikowsky recordings, this is the only one that is readily available for purchase (see: http://www.cdjapan.co.jp and search for Tchaikowsky). 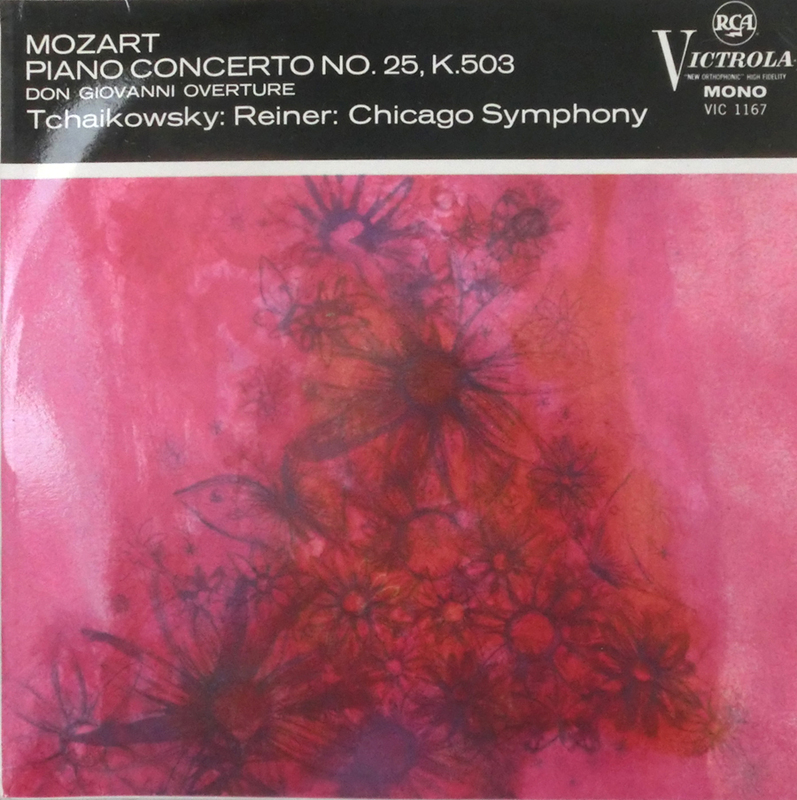 The Mozart and Bach concertos were featured in a live Chicago Symphony Orchestra concert on 11 February 1958, while the recording is from 15 February 1958. The original pianist scheduled for the symphony concert was Clara Haskil, but she became ill and was unable to play. André agreed to both play in her place and to play the scheduled concertos. 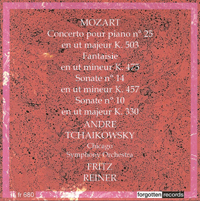 Arriving in Chicago only a few days before the performance, André's first stop was a music store where he bought the scores for both the Mozart and the Bach concertos and then went to the first rehearsal. "If Reiner liked a soloist, as he did such young Americans as William Kapell, Byron Janis, Eugene Istomin, and Van Cliburn, the collaboration was a happy one. 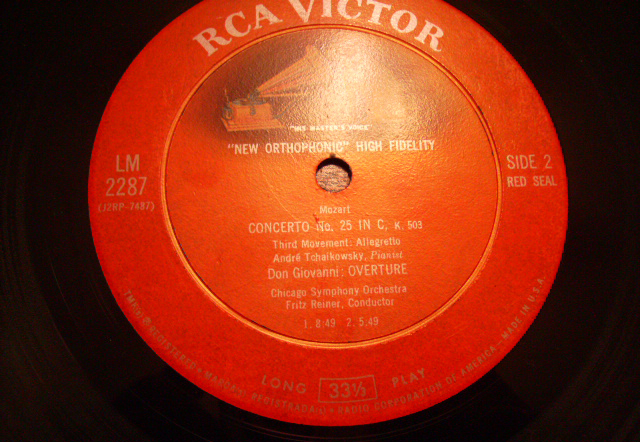 On the other hand, Chicago flutist Donald Peck recalled a recording session with the young Russian [should be Polish] pianist André Tchaikowsky. And Tchaikowsky was bouncing around and buttering up to Reiner... 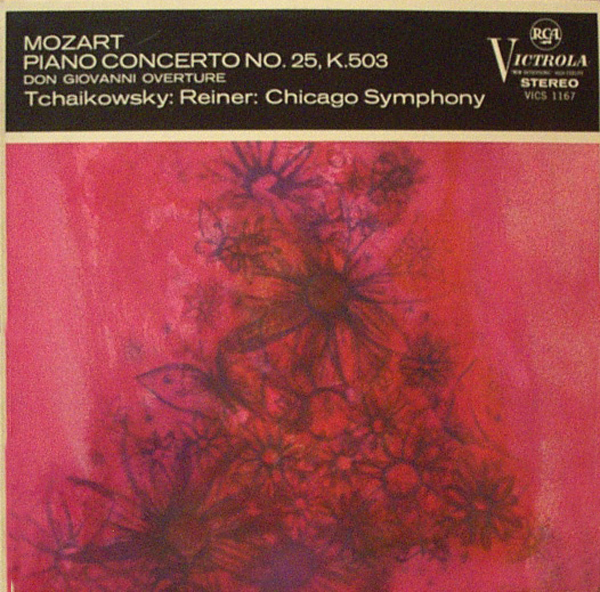 But during the middle of the recording session [of Mozart's Concerto in C, K. 503], Tchaikowsky said, 'You know, Dr. Reiner, I've never played this concerto before.'... Reiner said, 'WHAT? You've never played this, and you DARE to come here and record this with me and my orchestra?' After that, Tchaikowsky couldn't do anything right." 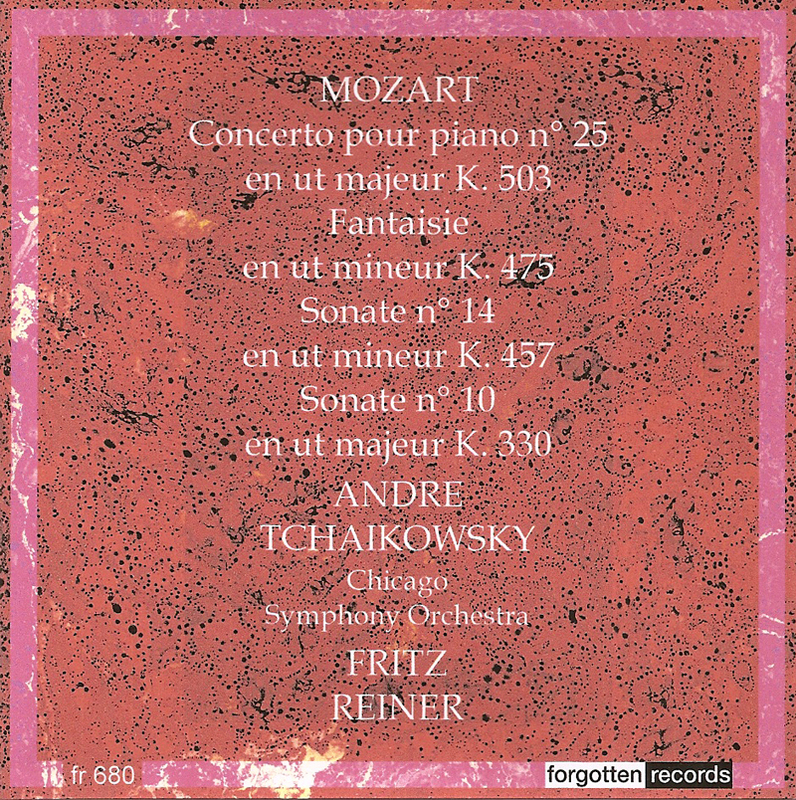 André Tchaikowsky, the young Polish pianist whose recital and record debuts stirred such hope for the future, underscored the validity of that reaction when he played Mozart and Bach yesterday with Fritz Reiner and the Chicago Symphony orchestra in Orchestra Hall. That he is in his early twenties means little except that if the gods are willing he has a long, rich time to go. More important is that he is a pianist of quality, of reassuring attainments, and of extraordinary potential. As sometimes happens in such cases, the piano is his refuge, the door to himself. Crossing the stage, he is a modest boy with a shy, sweet smile, a slight youngster with an undisciplined mop of dark hair. Bowing, he ducks his head with the gesture of a not yet harnessed colt. Playing, he is serenely sure of himself. He looks ten years older once he touches the keys. 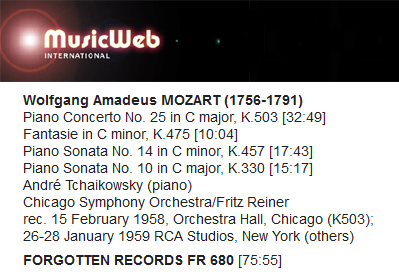 His Mozart was the great C major concerto, K. 503, his Bach a kind of concerto grosso with ariosos core. The Bach was crisply fresh in the high realm of chamber music collaboration, with a good left hand to fill in for double bass. 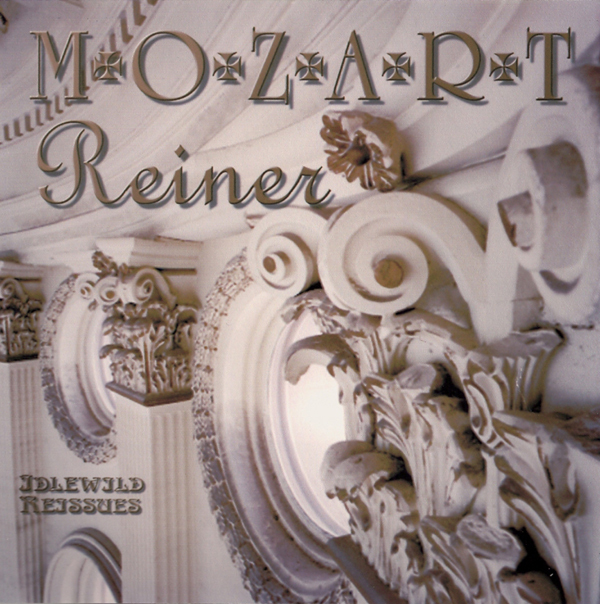 In the all but incomparable flowering of the Mozart, which is mutual enrichment for piano and orchestra, he understood and almost always communicated the felicity and the fire. 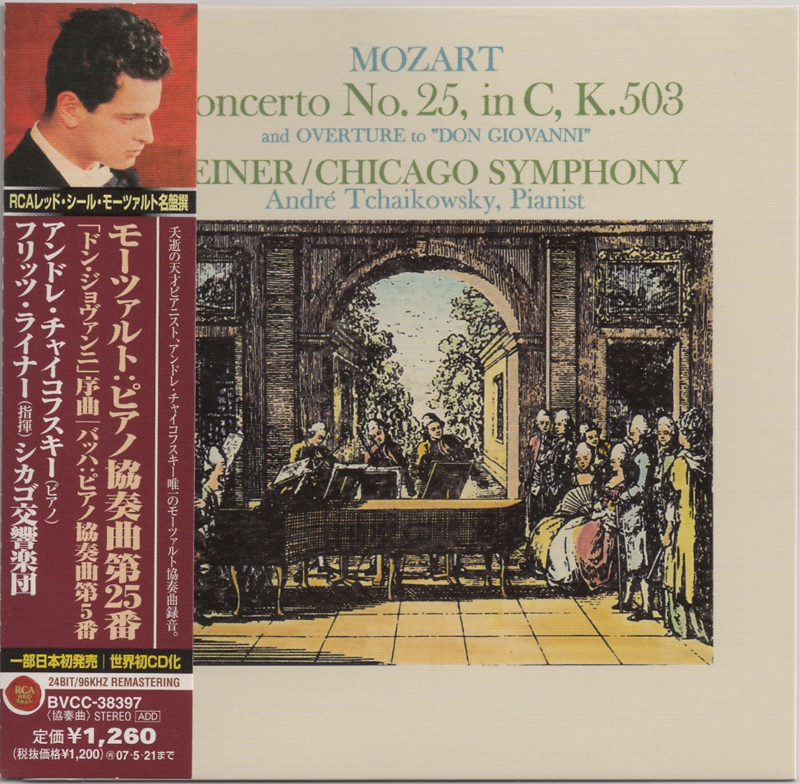 In fact, it was his high spirit that lifted the rondo from the orchestra's rather limp start - a limpness probably due to a hard week and a formidable recording bout. Other reviewers of this performance were not so kind. 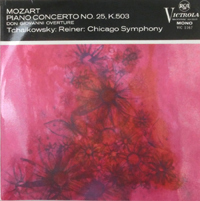 The headline for the review by Chicago American newspaper music critic, Roger Dettmer, read "Tchaikowsky Plays Mozart Like Typist." His review included, "Yesterday's problem was not how he played the piano (expertly) but where he learned his Mozart and Bach." 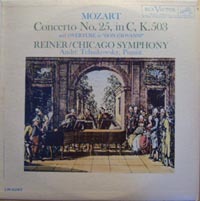 Under the headline, "Pianist's Efforts Not Up To Reiner's," music critic Robert C. Marsh of the Chicago Sun-Times wrote, "The Mozart was given a magnificent Reiner accompaniment, but the piano part was weak. The Bach drew better playing from the soloist but lacked the precision and polish of a thoroughly rehearsed performance." During the recording session a few days later on 15 February, the Bach recording came after the Mozart recording, and Reiner might have been a bit tired of André Tchaikowsky because the Bach was recorded in a single-take, a simple play through. 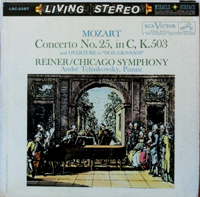 The Bach recording came to light in 1980 as part of a fund raising event for the CSO, and then again when RCA Victor/BMG (Japan) released a CD in 2006 that had both the Mozart and Bach concertos. 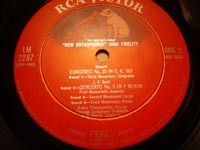 See: 1958 RCA Bach Concerto.